Does tire shine ruin tires? Since time immemorial, this is a contentious question that my family members and I have never found a consensus about. In fact, the other day my mum swore over her manicured nails that she would never allow chemicals to mess her beloved beetle’s tires. Truth be told, nothing comes close to driving around with a clean and shiny pair of tires. However, given the misconception and lack of information concerning tire shines, most people dread using them. What Is Water-Based Tire Shine? Conclusion: Does tire shine ruin tires? In this article, we are going to debunk whether tire dressing is bad for tires. And since we are talking about tire shines, we need to know the different types and how they work. To establish whether your tire shine is compatible with the tires, you first need to probe the components that go into making the product itself. Simply churn through the product label to establish whether the manufacturer has done due diligence in the course of product development or are simply looking to make a quick buck. So does silicone spray damage rubber? The answer is yes and no. This is because they don’t easily wash off and could harm your tires if you apply a new coat without thoroughly cleaning them. On the other hand, when correctly done, you could avoid all the messy unintended results. Here is a brief suggestion list for some silicone-based shines you can try. For more long-lasting products, read this article. 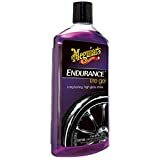 Meguiar is famous for developing some of the best car maintenance and detailing products. True to that, the manufacturer doesn’t disappoint in the G7516 as it has been voted as the best in terms of a lasting shine which may stretch over a month. This amazing tire shine product can be easily used on plastic. Autoglym ITD500US Instant Tyre Dressing - 16.9 oz. 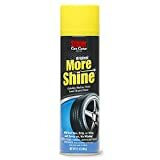 Another excellent silicone-based tire shine is the Autoglym tire shine. The product comes in spray form which is directly sprayed onto the tires. Although it happens to have a steep price tag, Autoglym leaves behind a more natural glossy finish. Read more about choosing tire shine products: Gel vs spray. Stoner More Tire Shine allows you to take the shortest route towards making your tires look their best. It’s a long-lasting tire spray that turns faded plastic trims and tires into sparkling clean thanks to the active cleaning agents. You will also appreciate the fact that it doesn’t require wiping. You simply spray on the plastic trims and walk away. Another unique selling point about the stoner car care is the tight nozzle. It provides a unique spray pattern and a wide coverage area without slinging off. Read about what is tire shine sling and what is the best nos-sling product here. Water-based tire shines are applied using an applicator. They are by far and large the less harmful gels considering they have zero petroleum ingredients. As a result, they give your tires a nice shine without browning or cracking them. Below, you can see the brief list of the recommended and safe products. If you want more information – check this detailed review. The Xtreme dress it is an all-rounded dressing that not only works great for the tires but also an excellent interior and plastic trim shine. The product has an extremely high durability rate and stays embedded on the tires’ surface leaving a lasting smooth finish. In terms of safety, the product protects your tires against natural and environmental luminaries that would damage their integrity leaving them as sturdy and clean as new. Since it’s water-based, you won’t have to deal with the greasy mess as it easily dries out. It is a good choice for everyday tire care. Another great water-based tire shine is Duragloss 321. It works great on tires, leather, and vinyl restoring them to their original luster. The non-silicone formula ensures that it has a completely dry and natural look. Chemical Guys is a great brand that is widely used by professional car detailers and dealers. The make-up of car tires is also important in determining how you go about in maintaining them. Antiozonant is one tire input that plays an important role in determining the integrity of your tires. This material is intended to reduce tire degradation from sun rays and is always present on the tire’s surface. Manufacturers incorporate this element into the tires such that as it wears out, the antiozonant is replenished on to the tire’s surface. Commonly referred to as blooming, it’s a continuous process which brings about browning on the tires. As such, tire shine needs to be appropriately applied without compromising on this process in order to work in a manner that helps overcome the blooming. How often your tires are used is another factor that significantly affects their break down. Irregular tire use over extended periods of time renders the antiozonant redundant in the sense that they don’t reach the tire’s surface. This means they have no UV rays protection leading to rapid degeneration. However, when you use a high-quality tire shine, you can protect the tires from these damages as they create a protective layer. With that said, irrespective of whether you are using a silicone-based or water-based dressing, heavy rains can also erode the layer. Another important element that can reduce the lifespan of your tires is the mode of application and how clean they are prior application. How to apply tire shine properly. When you decided to clean your tires, always settle for a good quality product that actually executes the intended purpose. You should also ensure you have the appropriate brush that serves the purpose. When it comes to the dressing application, ensure you apply the right amount on a sponge and then proceed to apply it. A sponge works great as it reduces the contact with rims which don’t ogre well with most tire shines. So, it all depends on the product you choose. A good product used in the right manner will go a long way in not only enhancing the tires look but also protect them. Look here to find a proper long-lasting tire shine products. The key lies in following the manufacturers’ instructions and knowing how to follow them to the letter. 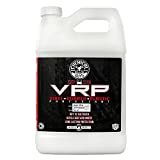 What Is The Best Water Based Tire Shine and Dressing Product on the Market in 2018? Spray And Gel Review.